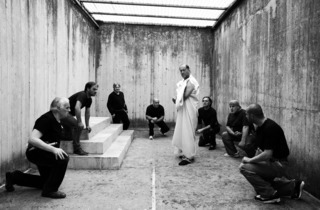 Hardened Italian lags putting on Shakespeare’s ‘Julius Caesar’ in a maximum security jail proves fertile ground for a slippery and suprisingly endearing drama about masculinity, role-playing, levels of reality and the power of art in this delightful, concise film from veteran Italian directors, the Taviani brothers. ‘Caesar Must Die’ begins and ends with colour footage of a grizzled all-man troupe, all flabby bellies and exposed moobs, putting on a play in a theatre in Rome’s Rebibbia prison. It’s arresting to see this grizzled bunch in robes and wielding wooden knives, but you wouldn’t want to spend too long in this am-dram scenario. We then pull back a few months to see straight-to-camera auditions with these men, and black-and-white footage of them rehearsing Shakespeare’s play, and it becomes much more interesting. This isn’t a documentary, but at times it feels like one, which adds to a nagging sense of uncertainty about what it is we’re watching. 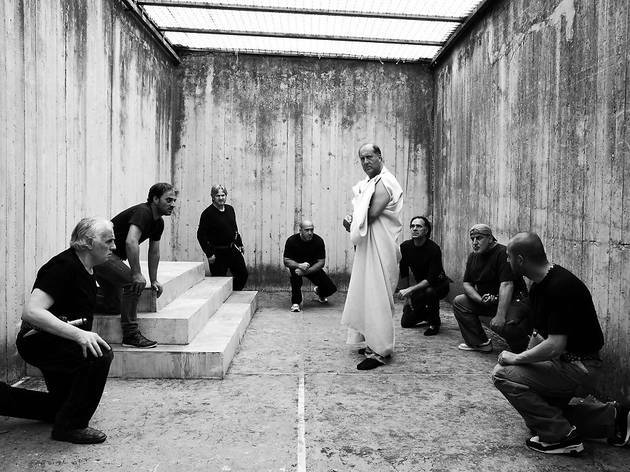 Very quickly the rehearsals move from formal sessions, with a director present, to scenes in which the prisoners act out scenes at length in the cells, corridors and yards they’re familiar with. Shakespeare’s lines merge with real talk, and you can see the prisoners reflecting on the meaning that the mob who killed Caesar in this same city has in the context of their confined, entirely male and perhaps violent lives. There are moments of reflection, such as when a prisoner rubs his hand along a seat in the theatre and wonders if a woman might sit there, and moments of tension, as when the actors playing Caesar and Decius lock horns while in character. It’s an arresting, playful and moving film, and it’s no surprise that a jury led by Mike Leigh (a director concerned with the bridge between the ‘real’ world and drama) awarded it the prestigous Golden Bear at the 2012 Berlin Film Festival. It was absorbing. The acting was top notch! On paper this sounded sublime, it should have been... but for me it didn't connect. The acting from the convicts was top notch (really excellent), but there as a background of faux-documentary that was clearly fake and took away from something that could have been brilliant. There are scenes where the convicts are expressing something of their lives within prison (without any spoilers, there's one scene in which a prisoner is upset by a visit). But these moments are so contrived and clearly set up (beautiful lighting and staging) that it gives an air of fake, which kind of ruined the film for me. Valiant, but flawed....... A real let-down for me personally.